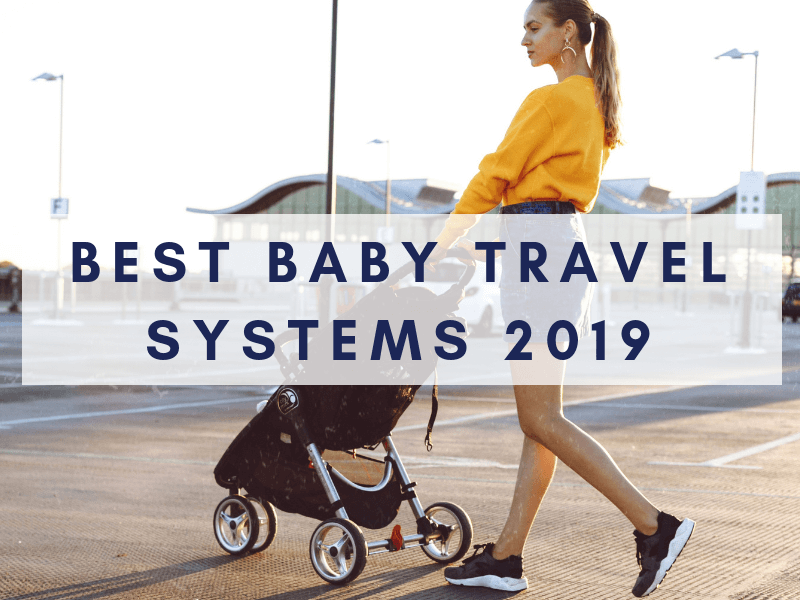 A lot of parents are asking what exactly makes the best baby travel systems? 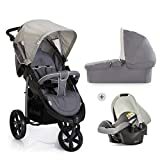 It is a common question raised by a lot of first-time parents as they search for the best combination of a pram, stroller and car seat that will take them through newborn to toddler stage. For starters, this kind of travel system should be durable and comfortable for the child and should have all the travel equipment needed so no more big purchases have to be made. The best travel system for 2019 should also be easy and intuitive to use and transform. If you can get a good one for a small budget, we’ve got a section for those as well. 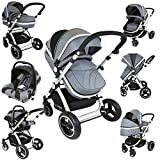 Here are some of the best baby travel system prams, strollers and car seats available now in the UK. 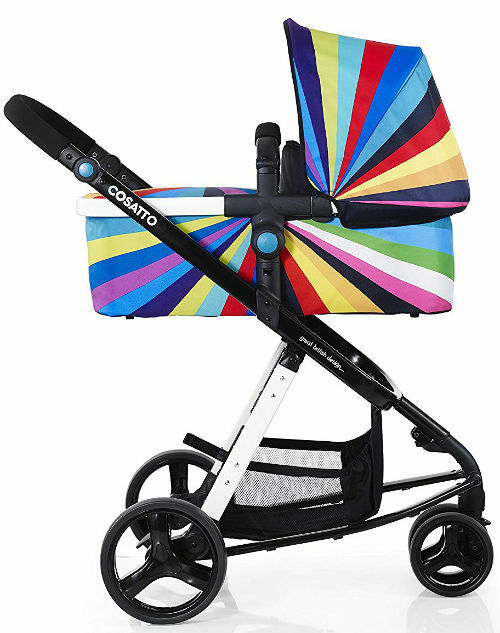 Pomp, colour, and style are some of the striking features of the award winning Cosatto Giggle 2 Travel System. The winner of the Loved By Parents Travel System in 2015 and Mother & Baby Best Baby Travel System in 2016 delivers a superior travel experience every time. The travel powerhouse comprises a chassis, carrycot and a dual facing seat unit to meet every need of modern parents on the go. The carrycot affords the baby familiar surroundings and creature comforts when on the road or going to sleep over at grandma’s house. The parent and world facing seat unit let you forge a strong bond with your little angel while letting them greet the street when they are older. The from birth carrycot boasts a comfy mattress to keep your precious newborn in a warm and cosy hug while the washable liner lets you keep the unit clean and sanitary at all times. A tummy pad, head-hugger, and chest pads ensure the safety and comfort of the VIP rider. A removable padded bumper provides additional safety while the reversible footmuff keeps feet toasty. The hood has a UPF50+ protection rating so you know your little one will be protected on the hottest of days. 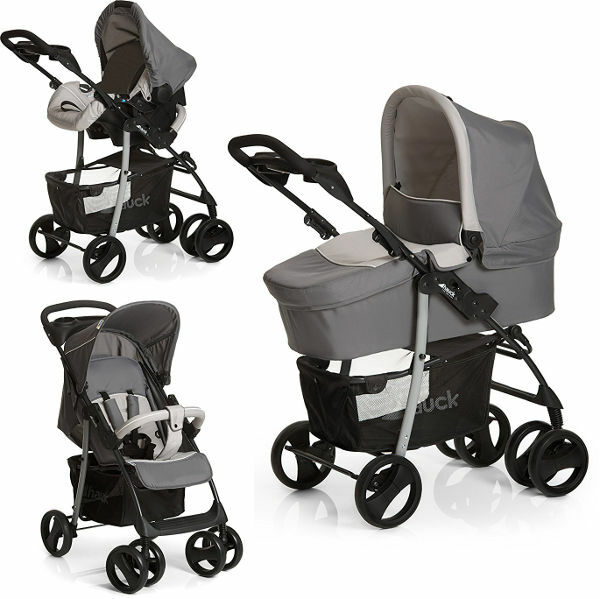 All-round suspension on the baby travel system chassis lets your little angel snuggle as you effortless power through the paths in the park or pavements as you head to the shops. Lockable front wheel with swivel capability lets you wheel around tight spots without breaking a sweat or disturbing naptime. The handle is adjustable so both you and your partner or family can find the right height for the most comfortable push. 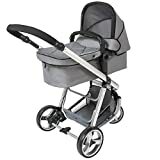 The compact, lightweight design and the easy fold of the aluminium chassis on the travel system make it easy to push, making each stroll an effortless adventure. A quick release mechanism on the wheels make for easy storage and cleaning after a day of adventures. The Cosatto Giggle 2 comes in a variety of bright and modern designs so you are sure to find one that suits your aesthetic. Most of the options of Amazon also come with a matching changing bag, rain cover, changing mat and messy bag. Make sure you check to see what you get for your money. A car seat isn’t supplied with this travel system, however the chassis is compatible with the Cosatto Hold car seat group 0+. The infant travel system weighs 11 kg and measures 97 x 62.5 x 87 cm. The i-Safe Travel System is a great investment for parents as it can be used for newborns all the way up to around 3 years old. The full baby travel system includes a chassis with carrycot or stroller attachment depending on placement. The stroller can be front facing or back so your little one can bond with you or face the world when they become more inquisitive. This system also comes with a car seat that can be attached to the chassis so you can use it as a shop and drive travel system. The system offers high-quality materials and a well-researched design that promote comfort not only to the baby but also to the parent. The pram/ stroller unit even has a large shopping basket to carry shopping and baby essentials. The stroller can be folded in order to make sure that it can be hauled in and out of your car without a problem. 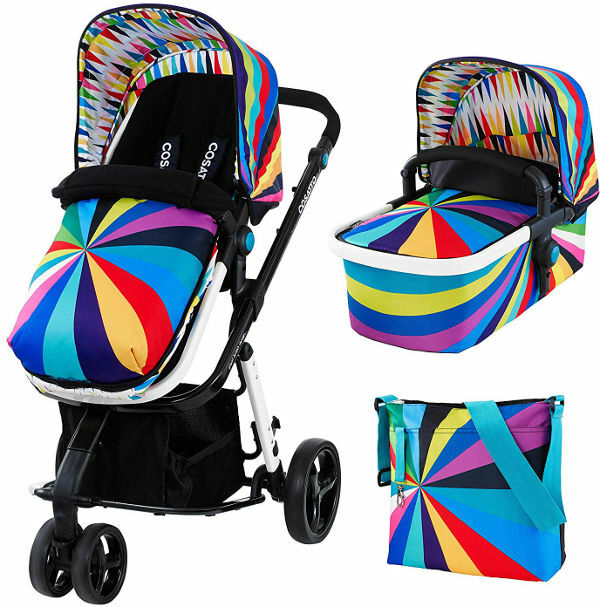 The i-Safe Travel System is a one of a kind travel system pram. It makes use of an aluminium material in order to support the weight of the baby but still be lightweight enough for ease of movement. The stroller features an adjustable footrest and the padded seat can be reclined in different positions to give the most comfortable ride positions for your child. The 5 point safety harness keeps your baby in place and has extra padding so they are comfortable as well as secure. 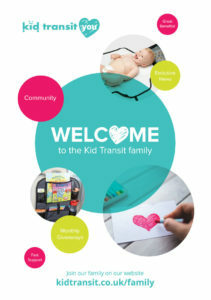 For most parents, the i-Safe Travel System is the perfect option in the market. Aside from its durability and comfort, the seat unit converts to a carrycot for your newborn and includes a car seat as well. This means that it adapts to the day-to-day activities of parents with a little one. It provides the versatility needed by parents. A rain cover is also provided that protects your child from the elements. The Hauck Malibu Travel System is a great option if you wish to have a pushchair, carry-cot, and a car seat all in one. Each part of the travel system is fully interchangeable with the car seat, stroller and carry cot all separate parts that can fix onto the lightweight chassis. 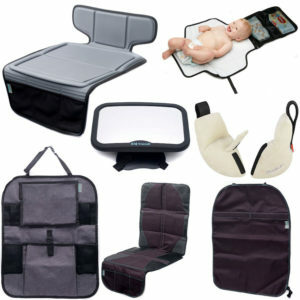 This baby travel system is the ideal product for parents in need of equipment that can help bring your child anywhere. This product offers improved stability in its design, not to mention easy manoeuvring up and down city pavements as well as on country paths. The Hauck Malibo Travel system was made for shopping, walking, driving and all the daily activities that you have to do with your child. 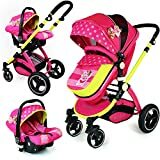 This product offers extra-large wheels that make it easy for parents to push the stroller especially on uneven paths and pavements. It even has front and rear suspension and shock absorbers so you can go ‘off-road’ with the stroller and still know that your baby will have a comfortable ride. And for safety, it has a lock on both rear wheels. For parents that travel in the car with their baby, the car seat can be mounted on adapters. 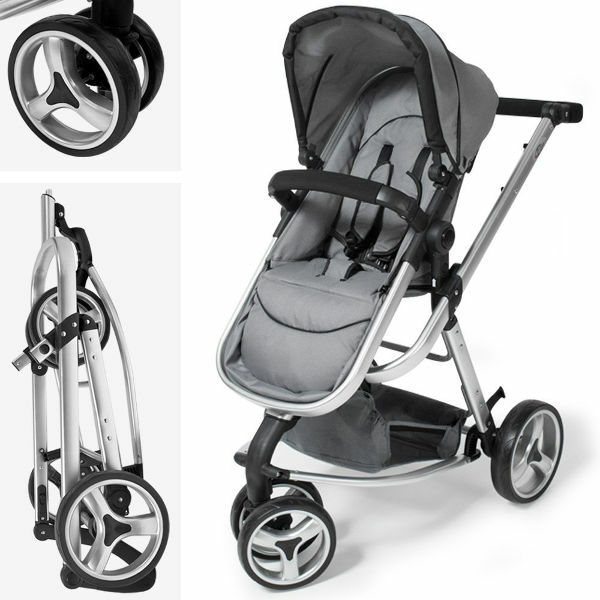 This helps parents move from point A to point B using this multi-functional stroller. It even has enough space in its large shopping basket that aids you in doing your chores or simply carrying all the things needed for your child. The chassis handle aslo has a cup or bottle holder so you can have that essential to hand at all times. Here are some things that Amazon buyers have to say about the Malibu Travel System. 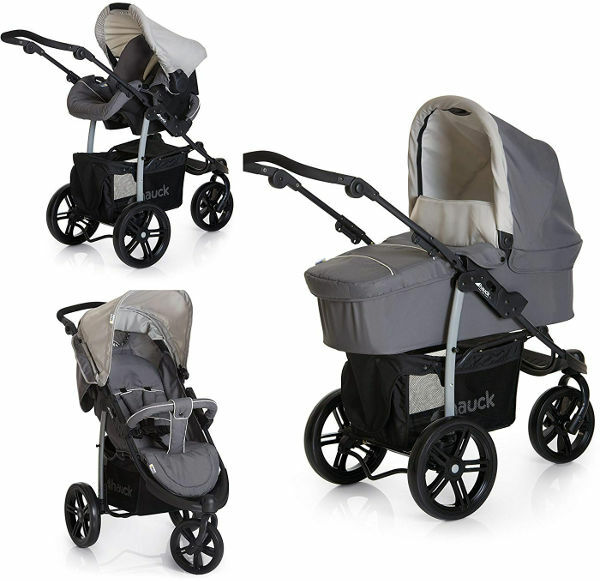 The Mea Lux Trio Travel System is another great option for a lot of parents. 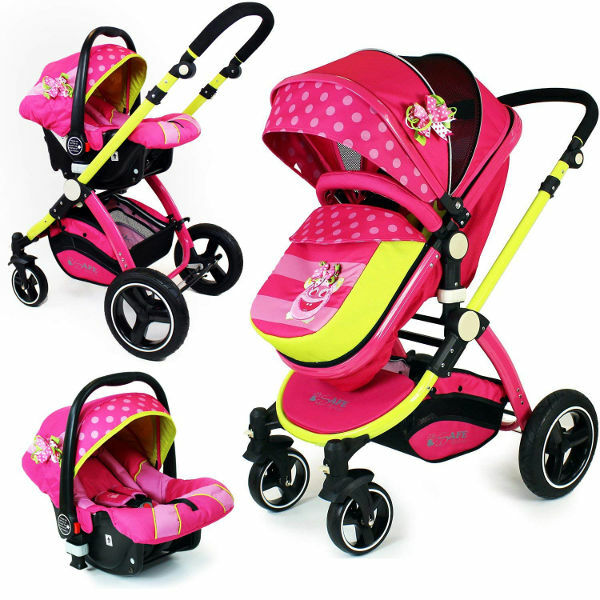 The travel system comes in a vibrant pink and yellow design that will help you stand out from the crowd, you’ll never mistake someone else’s buggy for yours with the Mea Lux! It has been made by iSafe using modern technology and design to give a great riding experience for your baby and ease of use for you. 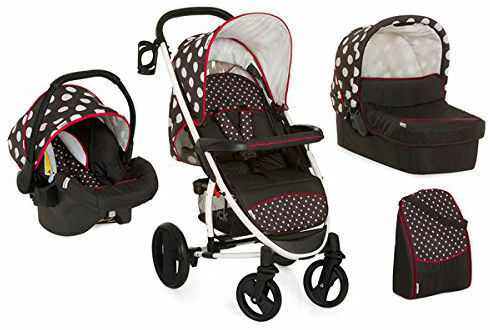 For starters, The Mea Lux Trio Travel System is easy to assemble and has a space-saving fold down option for quick storage in the boot or back home. The travel system pram has also been designed using a lightweight durable frame so you can manoeuvre the travel system easily. It has a one hand fold design making it easy to fold even for first-time users. 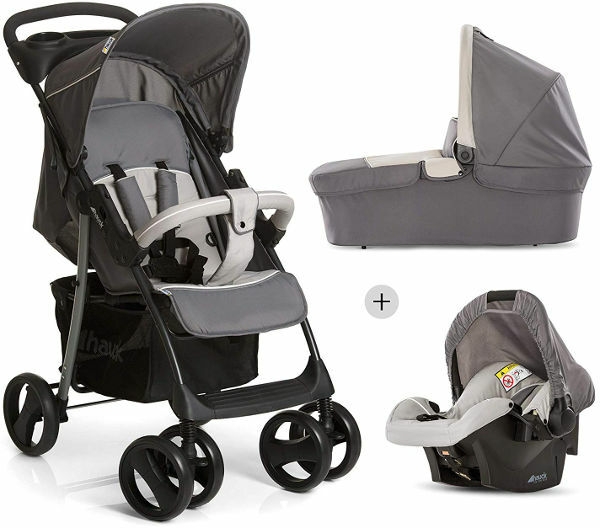 This makes it convenient to bring the Mea Lux Trio Travel System if you frequently travel with your baby. 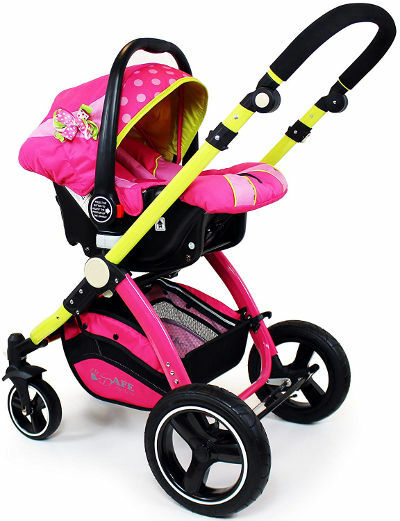 It has quality inflatable rubber wheels that have been integrated with a suspension system to prevent a rough ride for your baby. You can push this system easily over rougher terrain- great for trips to the park or country walks. It further promotes safety and comfort to your child as it offers a luxury car seat for the baby. The car seat attaches easily to the chassis so you can use the system as a ‘shop and go’ when your baby has a nap in the car and you need to do a quick supermarket shop while they sleep. The pushchair has a five-point harness to keep your child in his or her seat safely and comfortably. And since parents usually have loads of extra bit and bobs to carry around, the travel system has a spacious shopping basket that allows parents to use it for grocery shopping or simply for bringing nappies and milk. 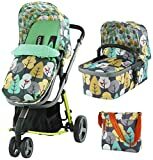 The Hauck Disney Classic Shopper Travel System is one the most affordable of the baby travel systems that we recommend here, however, don’t let the price tag fool you. This shop and drive travel system comprises a shopper pushchair complete with a 0+ car seat, carry cot, a changing bag, and a rain cover. 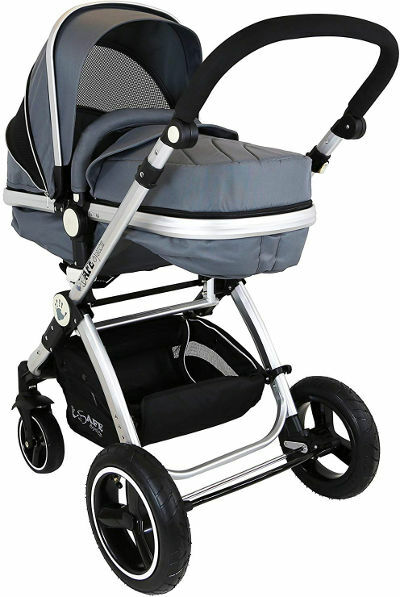 A strong steel tube frame for a durable, stable and stylish buggy that keeps your little one safe. The Disney tie in provides a modern sleek design that is also fun for your little one. A large shopping basket tray on the handle bar makes shopping with your little one a breeze while the cup holder on the adjustable handle keeps the bottle handy for when your little one gets hungry. Lockable front swivel wheels make for a great steering experience when navigating between aisles in your favourite shopping centre. The rear facing handle makes pushing the travel system an effortless task. A fully adjustable back rest on the stroller ensures that you keep the little angel in the most comfortable position while the adjustable foot rest keeps their little feet well supported and safe. The 5-point padded harness keeps your child in place without causing them any discomfort. The removable bumper bar provides additional safety when your baby is still young, and you can take it off when they are old enough not to need the extra support. The car seat features an innovative side impact system to provide all-round protection for your little one as you embark on a long drive. A 3-point padded harness and head protection let you strap in the baby while ensuring they are safe and comfortable. The car seat fits snugly with the 3-point safety belt for a secure fit with your car. The infant travel system weighs 7.6 kg, measures 82 x 52 x 105 open and 95 x 52 x 33 cm when folded. 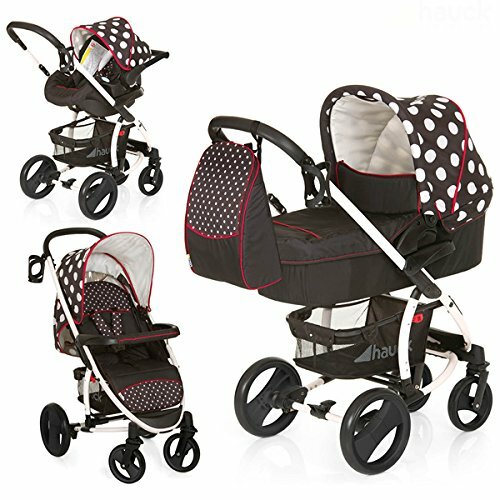 The Hauck Viper SLX Trio Set is a complete transformative travel system that goes from comfortable buggy to cosy carrycot, to a shop-and-drive system with the included car seat. The car seat is Zero Plus 0+ and has a 3-point belt guarantee for the best possible safety. The Hauck Viper SLX has a three wheel design that is both flexible and stable for walking paths or woodland tracks. The extra large wheels are ideal if you want to get out into the countryside with your little one right from the start. The Viper SLX is available in three different styles to suit your personality and includes a durable rain-cover for when the weather turns unexpectedly. 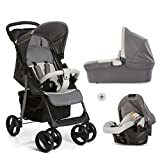 The adjustable handle is a plus for a travel system at this price point- especially useful if you and your partner are a lot different in height so you can both feel comfortable pushing your child. The Hauck Viper SLX weighs 20 kg and measures 114 x 55 x 107 cm and has a 3-point seat harness. 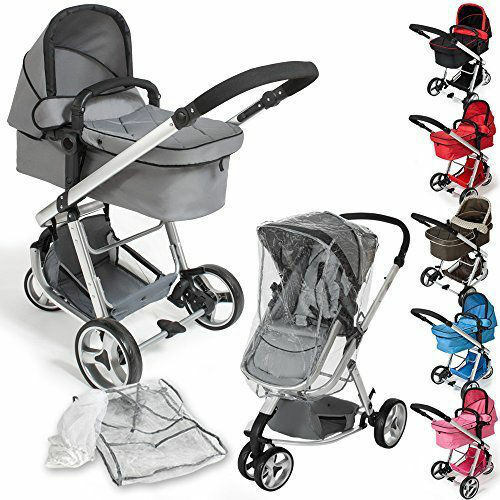 Stroller, carrycot, car seat and rain-cover all included on a strong, steel tube frame, the Hauck Shopper SLX Trio is of great quality, something that Hauck is known for. To make the pushchair a super comfortable ride, the back rest is fully adjustable as is the footrest. There’s an extra large basket for shopping or storage plus a five-point belt and front bar for safety. This trio is available in a number of different colourways. 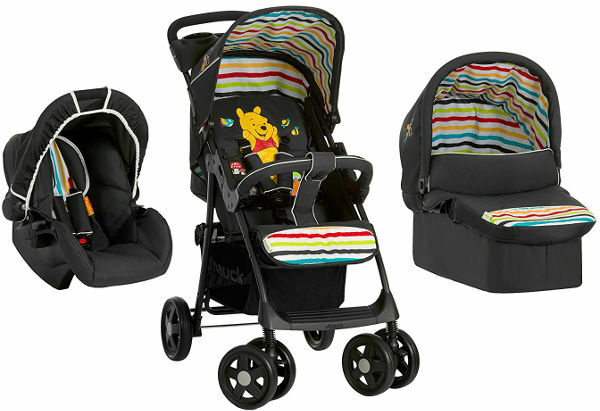 You can get the smart grey and black design, the more striking aqua style, or the cute but still practical Disney design with stripes and Winnie the Pooh decoration. 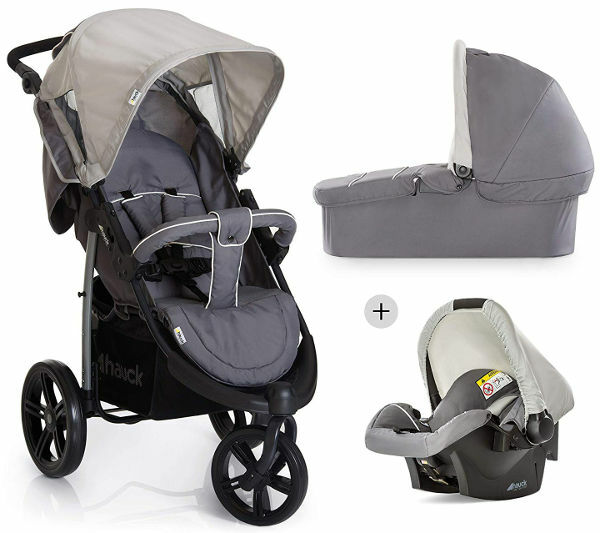 From birth to toddling, the Hauck Shopper SLX Trio is practical and spacious. 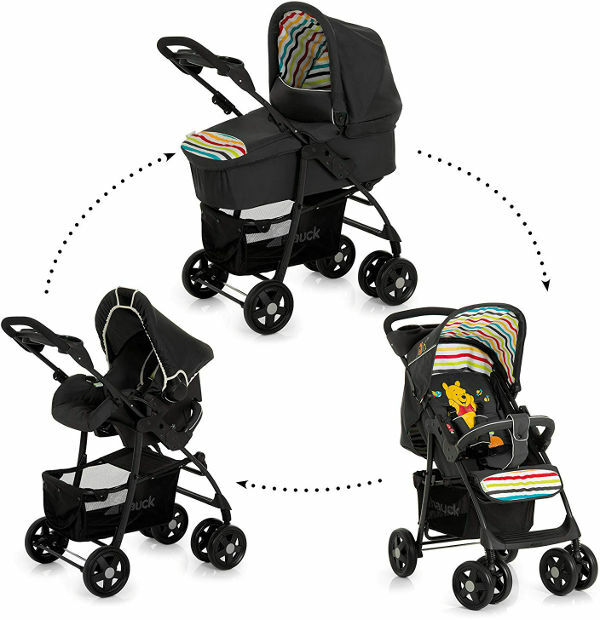 The buggy frame can be used in three different options to accompany your child through all their young life stages. 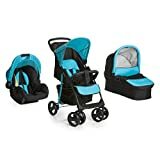 Either use it as a base for the car seat for short trips from car to shop, or have the carrycot set up when they are newborn for longer walks and day trips. When your little one is older and wanting to take a look around then use it as the practical pushchair. The Zero Plus 0+ car seat keeps your little one safe, with enhanced side-impact protection system, shock absorption and three-point belt ensuring optimum safety on every journey. Measuring 84 x 52 x 107 cm, the Hauck Shopper SLX Trio weighs 18 kg, making it one of the most light weight cheap travel systems on the market. This great, versatile stroller from TecTake will amaze you with how convertible it is and how lightweight. The TecTake 3-in-1 Pushchair Combi can be used from birth to around age 3 as a conventional stroller, sports buggy or baby carrier. The carrycot has a fully washable insert with super soft padding and 5-point safety harness. The set includes a mosquito net and rain-cover as well so you can protect your baby during the wet weather as well as in hotter climates. 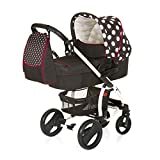 The double front wheel swivels 360 degrees and also locks when necessary on the TecTake 3-in-1, and the push handle is height adjustable so you and your partner or family can easily push the stroller in comfort. The TecTake 3-in-1- travel system is fully collapsible and compact for storage and portability. TecTake knows that style matters, too, and has offered the 3-in-1 travel system in a wide array of colours depending on what suits your lifestyle. Very lightweight – one of the lightest out there as far as cheap travel systems go – the TecTake 3-in-1 is only 10 kg and measures 108 x 59 x 111 cm. Finding the best baby travel system can be a challenge for a lot of parents. Given the number of options, we’ve come up with some of the best pram/ stroller/ car seat combos out there that looks after your newborn through all their stages until they are a toddler. If you need a lightweight, stylish and comfortable travel system, all these selections here fit the bill. Make your decision based on your budget and requirements when it comes to car seat, multi-position stroller and carrycot options.